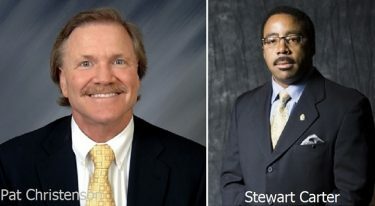 The National Wrestling Hall of Fame announced on Wednesday that its Board of Governors unanimously approved Stewart Carter (Olathe, Kansas) and Pat Christenson (Las Vegas) joining the Board of Governors, beginning with the next Board meeting on May 30, 2019. It was also announced that the Board unanimously approved Michael DerGarabedian (Old Brookville, New York) as a Governor’s Associate. Carter is currently the John Deere Logistics Manager for the United States and Canada, a role he began in 2017. He began working for John Deere in 1991 as an engineering intern and became a full-time employee in 1992, after receiving his bachelor’s degree in mechanical engineering from Southern University. He was a test and development engineer in Waterloo, Iowa, from 1992 to 1996. Carter performed various supply management positions from 1996 to 2000 in Moline, Illinois, before moving into leadership roles in operations, engineering and supply management in Coffeyville, Kansas, from 2000-2006. He returned to Waterloo as a supply management leader from 2006-10 before returning to Moline from 2010 to 2017 as a leader and project manager for supply management. Carter was a Big Eight champion and an NCAA champion while helping Iowa State win the NCAA team title in 1987. He was also named Iowa State Male Student/Athlete of the Year in 1987 and finished sixth at the U.S. Senior Open Freestyle tournament in 1988. He was inducted into the National Wrestling Hall of Fame Dan Gable Museum’s Glen Brand Wrestling Hall of Fame of Iowa in 2016 and in 2017 as a member of ISU’s 1987 national championship team. He is also a member of the Iowa Wrestling Hall of Fame and the Battle of Waterloo Hall of Fame. He received John Deere’s Enterprise Innovation and Collaboration Award in 2013 and was the recipient of the National Society of Black Engineers’ Gene Washington Champion of Champions Award in 2018. Carter serves on the University of Iowa’s College of Business Executive Advisory Board and on the Board of Corporate Affiliates for the NSBE. He is also a member of the National Black MBA Association and Alpha Phi Alpha Fraternity. Carter volunteers with Big Brothers/Big Sisters, March of Dimes / March for Babies and Junior Achievement. He was awarded his master’s degree in business administration from the University of Northern Iowa in 2009. Christenson has been president of Las Vegas Events since 2001. He is responsible for securing “Signature Events” and then ensuring their growth and success. During his tenure, Las Vegas Events has increased the number of events it has supported from 21 in 2001 to an average of 41 over the past five years. Most notably, the list includes the Wrangler National Finals Rodeo, four conference basketball tournaments, Electric Daisy Carnival, Rock in Rio, Life Is Beautiful, USA Sevens, NBA Summer League and USBC. The non-gaming economic impact of these events has increased from $108.9 million in 2001 to an average of more than $467.6 million over the last five years. Christenson walked onto the University of Wisconsin wrestling team in 1972 after being a two-time state qualifier for Oak Creek High School. Four years later, he won the 1976 NCAA championship at 167 pounds as an unseeded wrestler. Christenson upset No. 2 seed Jerry Villecco of Penn State in the first round and No. 3 seed Joe Carr of Kentucky in the semifinals before beating No. 5 seed Dan Wagemann of Iowa in the finals. Christenson placed fourth at the Big Ten tournament in 1973 and third in 1974 and 1976 while also wrestling in the East-West All-Star Classic as a senior. He was co-captain of the Badgers wrestling team as a senior and was also the recipient of the Big Ten Medal for athletic and academic achievement. Christenson coached briefly at Waunakee (Wisconsin) High School, leading the team to three conference titles, a regional championship, a sectional championship and a runner-up finish at the state tournament in 1980. He was recognized as an Outstanding American by the Nevada Chapter of the Hall of Fame in 2007. He began his career in venue management in 1980 as event coordinator for the University of Nevada Las Vegas athletic department. In 1983, he was promoted to assistant director of the newly built 18,500-seat Thomas & Mack Center. At the same time, UNLV took over management of the 30,000-seat Las Vegas Silver Bowl. Christenson was charged with developing programming to fill the venues and developing an operation for both venues. From 1983 to 1992, the Thomas & Mack Center and the Las Vegas Silver Bowl were arguably the two most successful collegiate venues in the country, averaging 175 events per year in both venues. In 1995, while managing both venues, Christenson developed the UNLV Sports Marketing Department, which brought together all aspects of venue and athletic inventory under one roof, including season and scholarships sales, promotions, sponsorship and merchandising. DerGarabedian, who wrestled at the University of Michigan and received the Lifetime Service to Wrestling award from the Hall of Fame’s Downstate New York Chapter in 2012, served as a member of the Board from 2013-2018 and was also a member of the Committee for the Preservation of Olympic Wrestling. The Board of Governors is responsible for preserving the history and tradition of the sport of wrestling in America by operation of the National Wrestling Hall of Fame & Museum in Stillwater, Oklahoma, and the National Wrestling Hall of Fame Dan Gable Museum in Waterloo, Iowa. The Board is also responsible for the annual election of Distinguished Members, Outstanding American, Medal of Courage, Order of Merit, and Meritorious Official. The Board is comprised of no less than 10, and not more than 30 members, who shall serve a maximum of six consecutive years in as many as three consecutive two-year terms. Three members of the Board shall represent United World Wrestling, USA Wrestling, and the National Wrestling Coaches Association. Those individuals are nominated by their organizations, and must be approved by the Board.